Collins Booksellers - Fundamentals of English Grammar by NC Sinha, 9789350487488. Buy this book online. English enjoys the status of the World Language. No other language has ever scaled this height. It is the language that encompasses everything in the world. It is used and cherished by millions whose mother tongue is not English. Spoken English, as a natural corollary to that, has become an important tool in our hands today. Without mastery over it, the gateway to success will remain a distant dream in today’s globalised market. Command on any language depends primarily on command on its grammar. Grammar is a repository of rules, governing how words are put together into sentences. These rules govern most constructions in a given language. Grammar is the science of correct use of language. It is concerned only with correct speaking and writing.Fundamentals of Grammar need to be fully comprehended to to acquire skills of quality English. 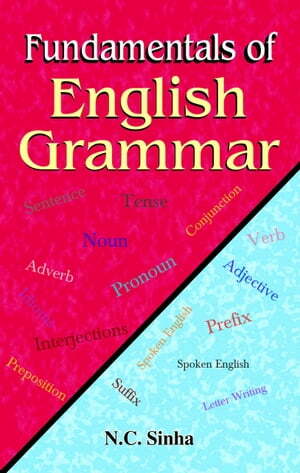 Aim of this book is a practical one: an aid to good English, to take you places on the wings of English. The book is designed to meet the requirements of students completing their schooling and entering colleges or job market, or preparing for various competitions.